Understanding the long-term care for your cabinets is a must. 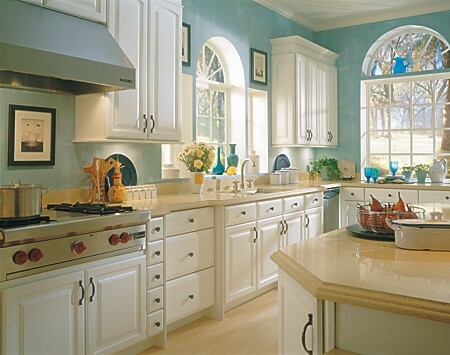 A lot of consumers are misled every day on what to use to clean their cabinets. If you have recently purchased your cabinets, please call and ask for your warranty and cleaning guide. Almost everyday, I will get the question on what cleaners do I use? For generations, our parents and grandparents have always used a wood polish, Murphy’s Oil Soap, or wax to clean their cabinets. These are products you actually want to avoid. They cause a build-up that will change the cabinet’s surface appearance over time, and can also void your warranty. Fresh solution of dish-washing liquid mixed with warm water. Mild all-purpose cleaner, with no ammonia or silicone. Using a stronger product can cause your finish to break down or discolor your cabinet finish over time voiding out your warranty. Please check your cabinet warranty before your first cleaning. You want to clean up spills and splatters right away. A lot of the everyday foods we cook with have oils or grease that can stain your cabinets or cause discoloration if left on the surface. Use a soft cotton cloth dampened with warm water to remove the splatters and spills. Any harsh chemicals such as tub and sink cleaners. Sponges, dish clothes, scouring pads, and steel wool. Use a clean soft cotton cloth. The prepackaged dusting sheets and aerosol are not recommended products with which to clean your cabinets. Waxing and polishing products may build up on the surface of your cabinets causing a hazy or streaky buildup. Avoid draping damp clothes or dishtowels over cabinet doors. This moisture can cause permanent damage that may result in peeling or discoloration to the finish. For a concise one-page overview of these tips, you can download and print our Kitchen Views guide, “Caring for Your Cabinets” (PDF).